Scenes of delirium as Ballymena United celebrate Gary Thompson's injury time winner against Harland & Wolff Welders. Picture: Press Eye. If there’s one thing that Ballymena United supporters enjoy, it’s a good old-fashioned omen. The fact that this is the Chinese year of the sheep was one that a delighted United fan was eager to tell me in the tight confines of the Harland & Wolff Welders clubhouse on Saturday. Even if Oriental astronomy isn’t your thing, it’s certainly hard to argue with the assertion that the footballing gods are on Ballymena’s side in the current Irish Cup run. If the previous round’s victory at Cliftonville had drama in spades, Saturday’s incredible comeback at Tillysburn Park was a Great Escape of Steven McQueen-esque proportions. It looked as though United’s Irish Cup odyssey - which has become part of supporters’ routine over the past two seasons - was going to come to an end after a performance which, if we’re going to be honest, had very little going for it. It had all the classic ingredients of a cup upset - the favourites missing a host of gilt-edged chances which could have killed the game as a contest; the lesser side grabbing the lead from the penalty spot and then grabbing a second in a terrific counter-attack; and then the senior side missing a penalty of their own. This appeared to be the day that Ballymena’s extraordinary record in cup competitions under Glenn Ferguson - which now stretches to six semi-finals in just over three years - had hit the buffers. Yet again, though, Ballymena pulled something extraordinary out of the bag. Crucially, the Sky Blues scored within two minutes of Matthew Tipton’s penalty miss and the seeds of doubt were sewn in the Welders’ players minds. Tipton’s acrobatic volley looked to have taken the tie to extra-time before Gary Thompson bundled home the winner in the most extraordinary penalty box pinball, followed by the scenes of pandemonium on the terraces that have become an almost weekly occurrence this year. Little wonder, then, that Glenn Ferguson’s first action as he emerged to meet the assembled Press after the game was a long exhalation of breath, the sort you would expect from someone who has just puffed heartily on a cigar. There was no real sense of excitement or joy from the manager - when asked to sum up his reaction, ‘relieved’ was the first adjective from his lips. Even the semi-final draw wasn’t the worst United could have faced - they will have been happy to avoid double-chasing Crusaders - but Portadown will be difficult opponents in less than three weeks’ time. 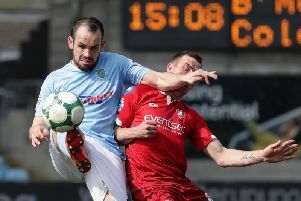 A city versus country Irish Cup final is guaranteed - if Ballymena’s current never-say-die attitude in the competition continues, there’s no reason why it shouldn’t be the Sky Blues who are once again fighting the provincial clubs’ corner on May 2. * Follow Times Sports Editor Stephen Alexander on Twitter (@Stephen_Bmena).